An offshoot of research from Apple's "Project Titan" car project is work on a smart seat belt that could be used to control a car's entertainment or even self-driving system in the future. Passengers in a car or van may enjoy the benefits of an infotainment system, but unless they are near to the head unit, they have no ability to control what is being played without asking another person or releasing their seat belt. Current systems also force everyone to listen to the same audio, unless they have headphones and their own entertainment source, which could cause issues for groups with differing musical tastes. Likewise, a self-driving car system may not have controls that are within reach of the driver, or if the standard steering wheel and pedals are removed, no direct means of control at all. Such designs would make it useful for firms in the self-driving vehicle field to create alternative ways to manage a vehicle's journey. Published on Tuesday by the U.S. Patent and Trademark Office, Apple's patent for an "augmented safety restraint" aims to solve that problem, and potentially more, by adding more elements to a seat belt. Apple believes it is possible to add sensors or components, like microphones and speakers, to the outward-facing side of a seat belt that goes across the chest, allowing for passengers to interact with devices. In one example, Apple suggests two spaced apart speakers could be embedded in the strap to provide an audio experience specific to a passenger. The addition of microphones in the restraint combined with speakers could allow for enhanced communication between individuals who may not be sat near to each other in a noisy vehicle, or to take part in a phone call via a smartphone connected to the infotainment unit. To interact with the strap, Apple proposes the use of a touch-based or haptic communication feature, with the former potentially able to interpret gestures from the user as well as tapping. For haptic feedback, vibrations could be transmitted through the strap to the user's chest, which could be used to alert to messages or, in the case of a driver, warn of potential issues like lane drift. The inclusion of gestures could allow for the seat belt to control a navigation system in a vehicle and its climate control system, among other elements. While the existence of an Apple patent indicates Apple has considered working in specific areas, they are not necessarily an indication of what to expect from future products and services, and may not even get to be used by consumers at all. Such an alternative control system would be handy for use in a self-driving vehicle, similar to the system currently being worked on as part of Apple's Project Titan. 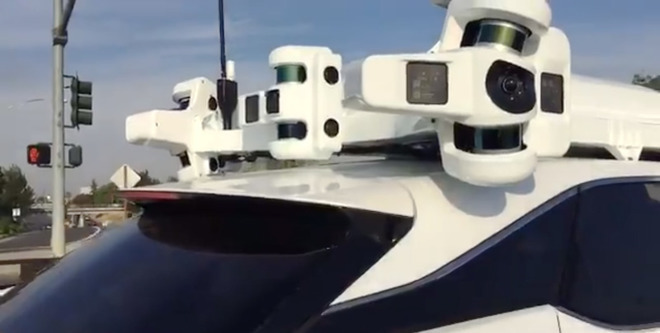 The project, which seeks to develop self-driving vehicle technology, currently has Apple operating a fleet of test vehicles in California, with Apple also potentially working with Volkswagen on the PAIL program to ferry employees between Apple offices in autonomous vans. Apple is also tipped to be working on its own car, one that is also likely to be self-driving, though such a vehicle is not expected to hit public roads until 2023 at the earliest. Last week, Apple cut more than 200 employees from its Project Titan group, as part of a restructuring effort. Apple has considered other ways for passengers to interact with self-driving cars, including one patent filing in March 2018 involving the use of a designated gesture zone within a vehicle that is the only place where gestures are accepted to issue commands to a vehicle. 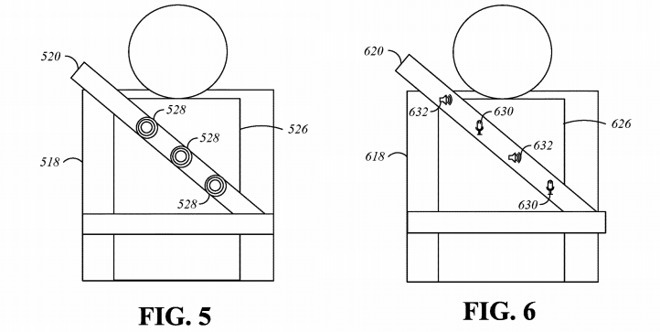 This is also not the only seat belt-related patent or application from Apple. "Haptic feedback for dynamic seating system," published in August, explained how a seat could be used to alert drivers to events by adjusting the seat and the tension of the belt, or in the situation where a crash is imminent, automatically shift itself to a position that is safer for the passenger before the impact occurs. I know it's not the focus of the article, but if there's one thing I won't buy, it's a self-driving car with no manual override. At least not until every car accessible acre of the United States is unerringly and always accessible to such a vehicle. That sounds dreadful. Let seatbelts be seatbelts. They are there to save your life not control your audio playback. Siri is the perfect user interface inside a vehicle not a bunch of complicated buttons and wires in your seatbelt. This is just an absolutely horrible idea. Take a simple device designed for safety and reliability and add expensive sensors and controls in an unergonomic way. I hope this is just a ploy to throw Samsung off. What, the idea of speeding toward a cliff at 65 miles per hour and you securely locked in place while screaming at Siri has no appeal for you? “Current systems also force everyone to listen to the same audio”. My car, my soundz, biatches. It's OK concept. I would rather see the controllers to be implemented on the back of the head rest so it's more visible. Screaming "play Van Halen Jump?"